First Sign drug screen 10 Panel Drug Test Cup is easy to use, no step, donor friendly urine specimen cup with results in just 5 minutes on the spot onsite screening. Shelf life 16-24 months, 12 months guaranteed. (25 cups per box) includes security seals, procedure card, free gloves and product insert with every box of 25 ordered. FSCCUP-47104 AMP BUP BZO COC mAMP MDMA MTD MOR OXY THC only $4.99ea. 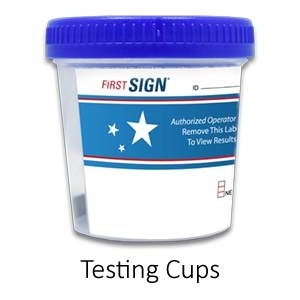 First Sign Drug Screen 10 Panel Drug Test Cup offers no dipping, no dripping and no tipping. The First Sign 10 cup detects 10 illicit drugs of abuse. First Sign is a donor friendly specimen cup and is ideal for pre-employment, random, post accident drug testing and screening. Testing for these drugs of abuse: AMP BUP BZO COC mAMP MDMA MTD MOR OXY THC (25 per box) Product code #FSCCUP-47104 10-Panel, 25/BOX only $4.99EA.